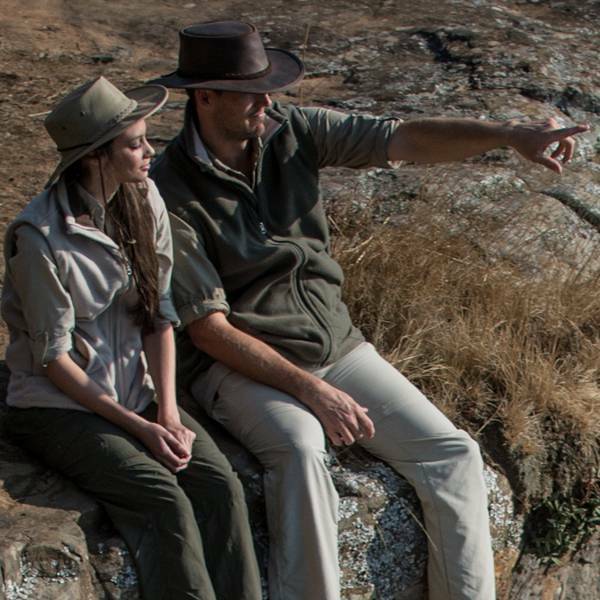 It is the little things which often make the biggest difference: not only to the enjoyment of your safari, but also to keep you comfortable and safe while you are in the wilds of Africa. These are items which keep you protected from insects, the sun, blisters, and night-time creepy crawlies. 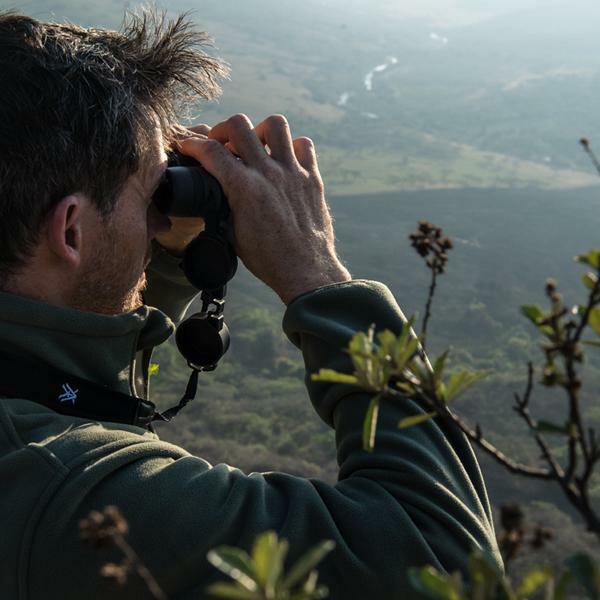 SAFARI ACCESSORIES ADVICE: Essential Items To Take With You On Safari. Essential safari accessories are the glue which keeps your other gear together. ⊙ Avoid being bitten: If you are travelling to a malaria area, you will need to take insect repellent as one of the precautions against being bitten (and bite relief in case any other flying insects bite you). The best way to avoid malaria and insect bites is to cover up in the evenings and use insect repellent. In some areas of the world, you may also find that flying and biting insects are active throughout the day. This is where applying a high-quality insect repellent which works is very important. ⊙ The more DEET the better? : This is simply not true. We have to be honest and say that, for a year or so, we believed that this was true - until we discovered leading Australian-made repellents. The Australian scientists behind our insect repellent brands have dispelled the "more DEET the better" myth bandied about by most insect repellent manufacturers (usually for marketing purposes). Through extensive tests, it has been proven that the effectiveness of the insect repellent does not increase once the level of DEET rises above 20%. What does increase is how long the product lasts on the skin. A standard 20% DEET repellent will usually last 4 to 5 hours. A product with 80% DEET will last for 8 to 10 hours. RID 19.5% Tropical Strength formula, as stocked by The Safari Store for sale for clients outside of the UK and EU, lasts for at least 6 hours (tests show it is usually between 7 and 8) due to its additional synergists that extend the length for which the product is effective. With 40% DEET content, the slow-releasing actives in Bushman Ultra Insect Repellent Pump Spray provides easy-wearing protection for up to 8 hours. Bushman repellents are available to ship to all our clients - both inside and outside of the EU. 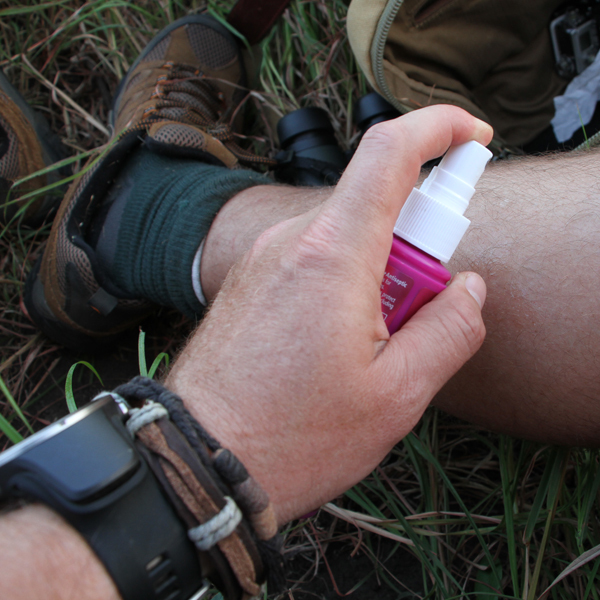 DEET at high concentrations may be corrosive to your precious camera gear and binoculars - and to your skin! The World Health Organisation and most medical authorities recommend that DEET products be below 50% as levels higher than this are known to cause severe skin irritation. ⊙ Kids & sensitive skin: DEET has been classified as safe by leading global health organisations and regulatory bodies. Although many reputable sources claim DEET is safe for use in children from two to six months old, we recommend use for children aged three and up for good measure, as they will then be able to communicate if any irritation occurs. Both Kids RID™ (for export out of the UK and EU only) and Bushman Ultra Insect Repellent Pump Spray are safe for use by children. Our interest is sincere. The findings so far on RID™ have been very positive but, given the number of species and varying conditions, we have to be realistic and accept that RID™ may not work in all conditions and for all species. It would, perhaps, be fair to state that the only 100% protection from the tsetse fly would be to go on safari in a bee keeper's suit. Along with burning dung and using smoke pots in the Land Rover while on safari (neither of which provide 100% protection), this is simply not practical. As a result, our research into RID™ vs the tsetse fly continues. Please ensure that you do not pack dark blue or black clothing as these colours are thought to attract the flies and their bites are painful. The Rufiji™ clothing range is all the ideal colour and RID™ is the only repellent proven to work against these flies which carry sleeping sickness and have a painful bite. We have yet to test Bushman Repellent for its effectiveness against tsetse flies. Once we do, we will publish our findings for your information. ⊙ Why do we recommend Australian-made repellents and what makes them so effective: The success of the top Australian-made insect repellents lies in the formula. With decades of providing protection to the Australian market, RID™ and Bushman repellents were developed with the aim of producing the best possible, most effective insect repellents for unique Australian conditions. The result are products made from high-quality DEET which are also perfectly-suited to African, tropical, and outdoor travels. ⊙ For maximum protection: Combine RID (export outside of the EU and UK only) or Bushman (international) with our BUGTech™ range of clothing. ⊙ Avoid sunburn: With mean high temperatures reaching mid 20 to mid 30 celsius on most safaris, and with safari areas in Kenya, Tanzania, Botswana, and Zambia high above sea level, the effects of the sun will be pronounced on your safari. Safaris involve outdoor activities almost by definition. Ensuring that you do not get burnt on the first few days after you arrive in Africa, which could make being in the sun not much fun for the rest of your safari, should be your top priority. Most of us travel to Africa for the sun - and so it makes sense to enjoy your time in the sun safely and with a good level of protection. 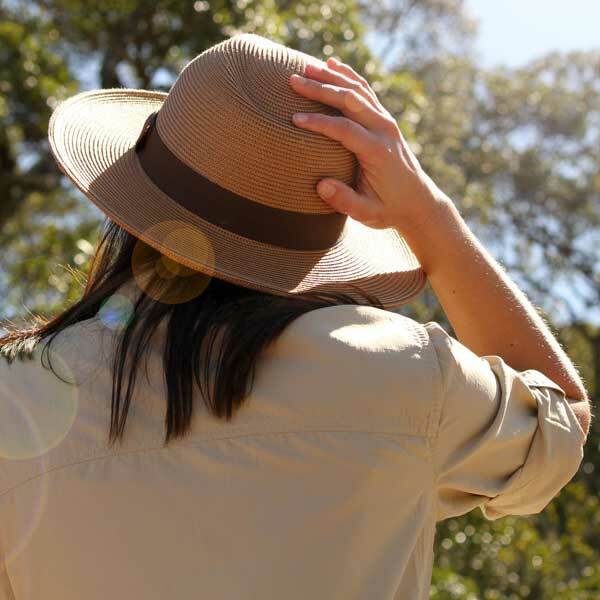 ⊙ Pack a wide-brimmed hat: To prevent having your face and neck burnt by the sun during your safari activities you will need a wide-brimmed safari hat. Modern wide-brimmed hats are conveniently packable too and so do not lose their shape when you take them out of your luggage as the hats of yesteryear used to do. ⊙ Wear effective sunscreen: Pack a highly effective sunscreen which has been proven to work under an intense sun. It is sensible to select a sunscreen which offers high protection and is a broad spectrum, long-lasting transparent protection from both UVA and UVB light. As most safaris are active, also opt for a sunscreen which allows you to perspire without losing the efficacy of the active ingredients. As a general rule we recommend aerosol sprays over creams for this reason. Re-apply sunscreen frequently after prolonged physical exertion and if you have towelled yourself down or worn a shirt after swimming. ⊙ Pack a good torch: While it is true that high-end safari lodges do have askaris to walk you back to your room at night, they are not always shining where you are walking. 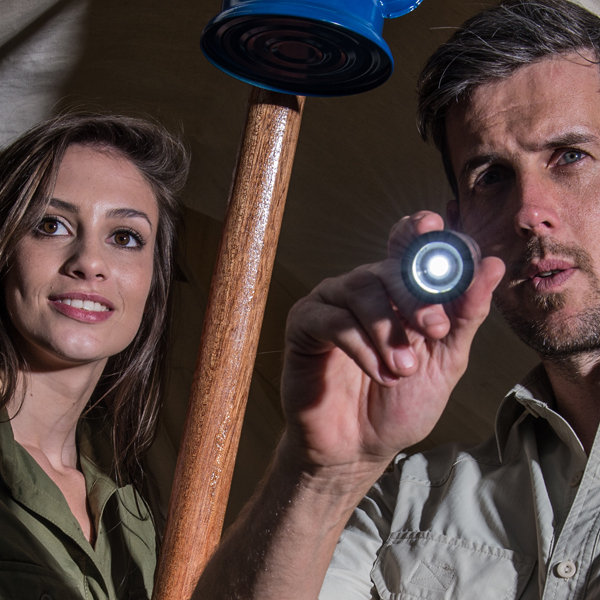 Packing a good torch is important for all safari as it increases your safety while in camp. Not only does a good torch mean that you will avoid standing on any reptiles, arachnids or insects at night when walking within the camp, but you will also be able to spot and avoid wildlife which may have wandered into the camp in the evenings as most camps are unfenced. That aside it is also great fun to use your torch to spot nocturnal wildlife from the safety and comfort of your room or from the lodge. ⊙ Take comfortable socks & good shoes which prevent blisters: Walking in the bush while on safari is the quintessential experience. We recommend it to all who go to Africa. Whether you go for a short nature walk with your guide, or a multi-day walking safari please ensure that you pack socks which offer a double layer for blister protection. Blisters, especially on longer walking safaris, could make for an uncomfortable time in the bush. Please bear in mind that the terrain in Africa is often uneven and may be hard and rocky too. If you anticipate that you will be walking in sand, we recommend shoes which will minimise the amount of sand which will go inside the shoe and which may also cause a blister. Again though, on foot is really the best way to see and experience the bush. ⊙ Binoculars: We rate binoculars as the most important safari accessory and so we have created a separate advice page for binoculars. Please click here to view the page. For clothing and luggage we have also created separate advice pages. Listed below are some of our expeditions which we arranged to field test our products. Into the unknown: The Okavango Delta Expedition. For comprehensive information on what to pack for your safari, get your free, detailed safari packing list.